The Heating and Hotwater Industry Council (HHIC) has launched the “Retro Boiler” label scheme. The scheme has already gained support from the government and aims to increase consumer awareness of boiler efficiency. Retrospective boiler labelling can be easily completed during engineer visits. HHIC and its members will work with the industry, supporting them to adopt the labelling scheme. When an installer identifies a non-condensing boiler with a permanent pilot light during the visit, they will affix the retro-label to the boiler. “HHIC estimate that there are approximately 9 million inefficient boilers in the UK. A large proportion of these are over 20 years old and would be classed as ‘zombie boilers’- boilers with old technology that never seem to die, yet remain highly inefficient- costing homeowners in terms of higher bills, the planet in terms of higher carbon dioxide emissions and a contributor to poor air quality- compared to a modern condensing boiler. A growing number of consumer electrical products such as washing machines, fridges and vacuum cleaners feature an energy label, which helps consumers to quickly assess how energy efficient their appliances are, and therefore how much it will cost to operate. 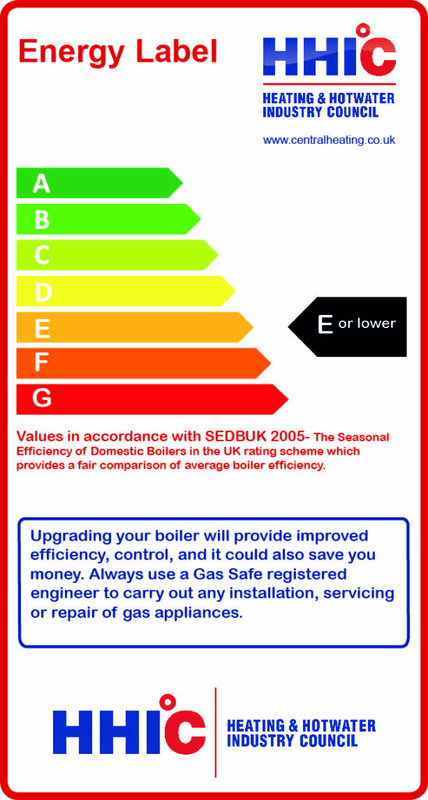 The heating industry recognised this and under this ‘Retro Boiler’ label scheme will be providing a similar label for older inefficient models. Download the HHIC’s “Retro Boiler” label guide below. Using the English Housing Survey, HHIC estimates that the replacement rate of non-condensing boilers is approximately 10% a year. If the proposed scheme resulted in the replacement rate increasing to 11% in its first year (approximately 90,000 boilers), this could result in an immediate carbon saving of 62,000 tonnes per annum. Furthermore, this would equate to a cumulative bill saving of £14 million. HHIC is also working on a standardised servicing regime across the industry. Retrospective boiler labelling will form a part of this service process, which can then be adopted by all installers carrying out a service.